Texas Select game day ticket holders will also get to attend the "Rally" from 10am to 4pm (see above), plus attend all of the Texas Select Championship Games. Self Guided tours will be open till 8pm. 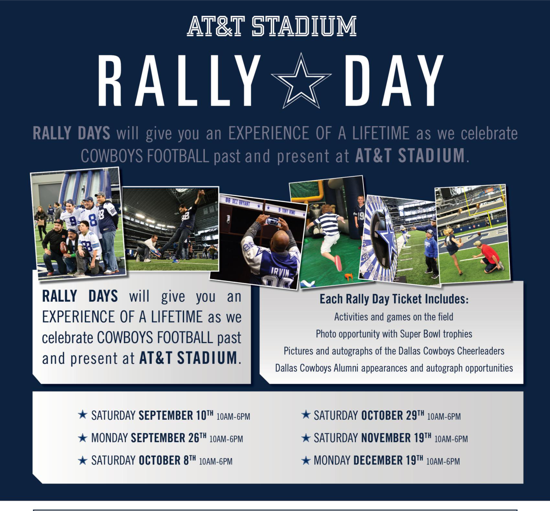 Tickets Purchased at the AT&T Cowboys Stadium will cost $30.00 and will be available inside the front at Entrance K. (Tickets purchased outside at the Box window are not good for the TSYFL Games). TSYFL Playoffs will begin Nov. 5th. Top 6 teams in Flag, 8U, 10U, and 12U. Number one and two finishers in each age group will have a bye on November 5th. Finisher number 3 will play number 5, and number 4 will play number 6. The 3/5 winner will play number 1, and the 4/6 winner will play number 2 on November 12th. The winners Nov. 12th will advance to the AT&T Cowboys Stadium in Arlington, Texas on Nov. 19th to play for the League Championship. Game time is 6:00pm starting with the Flag, followed by 8U, 10U, and 12U. The 2 top finishers in 14U regular season will play for the League Championship Nov. 12th at Wheatley Heights Sports Complex. 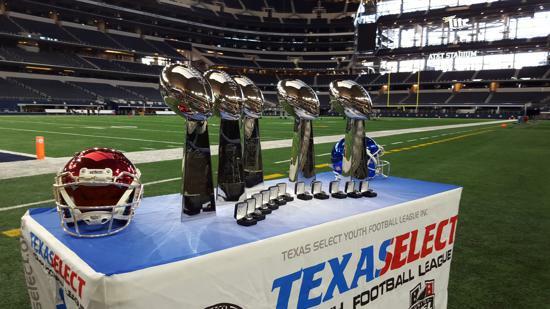 TSYFL League Championship games returned to the AT&T Cowboys Stadium in Arlington Texas for a 3rd consecutive year. Flag, 8U, 10U, and 12U. November 19th.